Which is the right toothbrush for me? Have you walked down the dental aisle in your local grocery or department store? There seems to be nothing simple about brush, floss, and visit your dentist regularly! Hard, medium, soft, or super soft toothbrush? Manual toothbrush or powered? If powered, then ultrasonic or rotating head? And is the $89.00 brush that much better than the $7.99 brush? Floss, dental tape, waxed or expanding? One can get dizzy and spend a lot of money trying to navigate this aisle and all the marketing pitches. So many options can be overwhelming! So here are the basics! Toothbrushes – Always choose soft or softer. Teeth are important to clean at the gum line, or the area where your teeth and gums meet that holds onto the plaque. Your brush needs to be soft so that you can place the bristles right on the gum line and gently massage in circles until clean (about 10 quick circles per tooth inside and out). The style and color are really about what you like and what feels good in your mouth. The bristle shape and inclusions like silicone circles and bristles are for looks and feel. The mechanical action of the bristles massaging the gum line and enamel is what cleans the teeth. 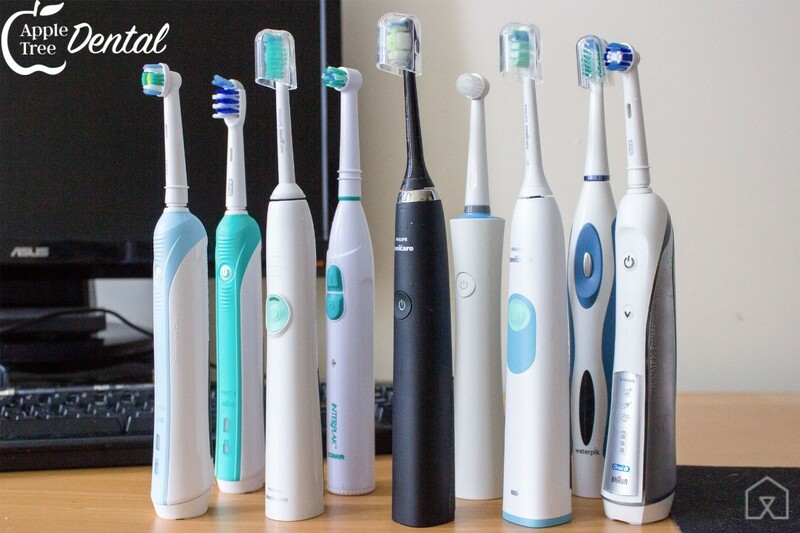 Each toothbrush has a lot of different features. Dexterity - the larger handle on power brushes make them easier to manipulate. I prefer inexpensive battery or rotary brushes in these cases. An electric toothbrush can be very helpful! Stain - whether your stain is from smoking, tea, soda, vitamins, or a number of other things that cause stain, a power toothbrush will help fight it and keep your teeth whiter between cleanings. I prefer ultrasonic toothbrushes for this problem. Stain and build-up that need your hygienist help! Orthodontics- adding wires and devises makes the brushing time increase. Power brushes clean better faster, saving time. I like most power brushes for orthodontics--just keep in mind the heads will wear out and need changed frequently, so cost-effective replacement heads are an important consideration. Braces can make it harder to brush. Periodontal disease – gum disease and recession require additional time and meticulousness--power toothbrushes can help do the job faster. I like ultrasonic brushes in most cases, however when recession is a problem ultrasonic brushes are sometimes too powerful, and use must be limited to morning or night alternating with manual brushing. Extra soft rotary heads or tapered heads also work well. Lots of different electric toothbrush options too! Time – Some of us just don’t brush for as long as we know we should and some of us brush too long and hard. Most power brushes have a timer system that keeps you honest with your oral hygiene. The most important fact when purchasing any toothbrush, power or manual, cheap or expensive, is that it won’t work sitting on the counter or in the drawer. It must be used diligently, morning and night, to be effective. Check back soon for the next segment of back-to-basics to get the low-down on toothpaste and floss!